Mother always said not to play with our food, and having meals with the rest of the family is always an important aspect of life. After all, it is difficult to share a table with someone whom you have just fallen out with, right? Hence, it is a good practice that teaches us how to reconcile to one another, and here is the $7.95 Spafoon which might just make the reconciliation process a whole lot easier. After all, laughter is said to be the best medicine, and when you hold up this nose shaped spoon to your face, even the hardest of hearts that has been hurt by you ought to melt – after all, we are family. 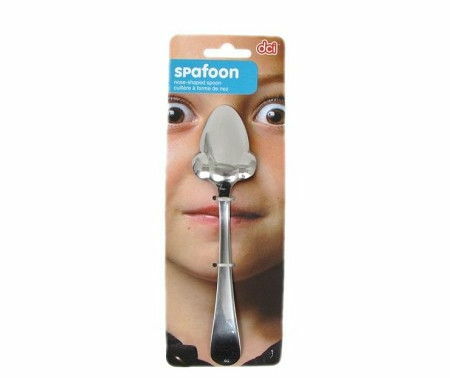 The Spafoon is made out of stainless steel, and it functions like a regular spoon – until you lift it up to your face, that is.